Read any online construction forum and you’re sure to see a discussion on moisture problems, especially pertaining to slab-on-grade flooring. Moisture vapor transmission, or MVT, is becoming an increasingly expensive challenge for commercial and industrial building designers, contractors and owners. Site conditions can contribute to a concrete slab demonstrating undesirably high moisture vapor transmission levels. When this occurs, moisture vapor finds tiny pathways upward through the slab via capillary action, finally condensing into a high-pH liquid. Buildup of this alkaline liquid on the concrete floor surface can destroy the ability of industrial flooring to bond to the concrete substrate. In years past, contractors were forced to wait for new concrete to cure fully, prior to installing floor coatings. Various cumbersome tests were done over time, with the hope that the slab moisture would subside. We now know that some concrete slabs can take months before their MVT level is safe enough for typical coating system application. Other concrete floors may never achieve an acceptable level. With today’s tight construction deadlines and even tighter budgets, waiting with fingers crossed is no longer an option. 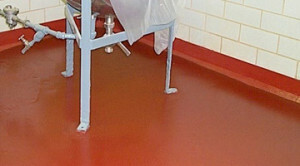 What Moisture Vapor Mitigating Floor Coatings Do You Need? One of our highly experienced local representatives can evaluate your facility’s concrete floor for moisture vapor transmission and relative humidity. These test results will determine which of our MVT industrial flooring systems will work best for you and your budget. These and other attributes make our moisture vapor mitigating floor coatings & systems ideal for virtually any application. When installed in accordance with our proven method, these moisture control floors remain well-bonded and perform as promised. 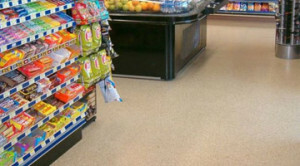 The full range of our MVT industrial and commercial flooring, with your choice of utilitarian or highly decorative skid-resistant finishes, is available with full MVT flooring protection. Our moisture vapor mitigating floor coatings work, plain and simple—we’re so confident, we guarantee it!